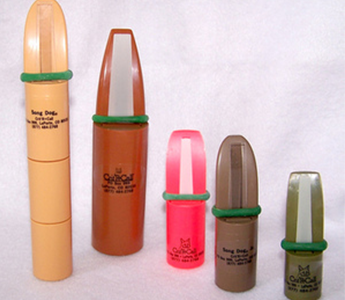 It was created and invented in 1976 to put more authentic animal sounds into hunters' hands. We designed out the flaws of other calls, making the Crit'R·Calls freeze-proof, extremely durable, and guaranteed not to fail on the job. The tough plastic material chosen for the Crit'R·Call was selected for the crisp sound quality it produces, making animal sounds as good as the animals make them. Known best for predator calling applications, the Crit'R·Calls have a 33-year history of successful deer, elk, moose, bear, and lion hunting applications, mostly under other labels. The four basic Crit'R·Call designs are very reliable and successful for whatever game to which they are adapted. The Crit'R·Call is an open-reed style, designed to operate like a voice box. It has a vibrating reed which allows the caller to determine whether high or low pitches are used. It takes the place of 24 other calls, producing sounds which are very loud or very quiet, shrill and aggressive, or wimpy. The various predator and big game calls are made from the basic Crit'R·Call model, using specially designed reeds to produce the optimum sound quality for the species. An instruction booklet giving detailed use and hunting instructions accompanies each call for each species. 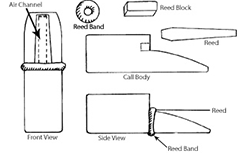 Each call comes with two or more reeds, two or more reed blocks, two heavy rubber reed bands, plus instructions on how to use the call. The instructions are the most thorough in the business. merchandise is generally shipped the day the order is received, or the next business day at the latest, even during the busiest season. RMWP is small with experienced staff, which produces quick and competent service on all orders. We have telephone, e-mail and Website access to our business. Major L. Boddicker grew up on a farm in Benton County, Iowa. He bought a Model Perfect Predator Call from Herter's in 1954 and has been hooked on varmint calling since. Major has a bachelor of science degree in biology from St. John's University, Collegeville, MN (1964), a master of science degree in zoology, and a Ph.D. degree in entomology from South Dakota State University, Brookings, SD. He has been a Smokejumper for the US Forest Service, college instructor of zoology and human anatomy, environmental education specialist, 4-H outdoor education specialist, and wildlife damage control and furbearer management specialist during the 12 years he worked for government. Then he had a middle-age epiphany and started Rocky Mountain Wildlife Enterprises in 1985. Varmint hunting, trapping, and researching wildlife has been his life's work. Crit'R•Calls are the products of that research and experience. Since 1985, Major has traveled the world teaching hunters and stockmen how to call and trap predators. He has experience in using Crit'R•Calls to call elephants, hippo, crocodiles, hyenas, lions, leopards, rhino, cape buffalo, African lynx, black-backed and side-striped jackals, baboons, and many other African species. He has called jaguar, cougar, ocelot and peccary while working in Peru. How do you contact us? When you give us a call, a real live human being will answer the phone from an office in Colorado, no foreign speak to deal with. Either Emily or Joshua will be able to help you. Thank you for your interest. For questions or comments regarding sales, service, or business development, please use the information listed here. We look forward to hearing from you soon. New dealers are always welcome.